Philosophical Investigations: Utopia: An End, or a Quest? Utopia: An End, or a Quest? A laconic, even breezy counterpoint to the imperfect and in some cases heavily flawed dystopian societies that actually populated the world — More’s utopia presenting a republic confronting much that was wrong in the 16th century. More’s utopia promulgates the uplifting notion that, despite humankind’s fallibilities, many ills of society have remedies. Two other writers, Daniel Defoe and Jonathan Swift, who wrote Robinson Crusoe and Gulliver’s Travels respectively, were both authors of popular 18th-century stories that took inspiration from the utopian principles of Thomas More. 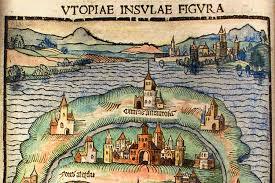 The word ‘utopia’, coined by More, is from the Greek, meaning ‘no place’. Yet, it seems likely that More was also punning on a different word, pronounced identically, which applies more aptly to history’s descriptions of utopia — like that captured in Plato’s Republic (of ‘philosopher-kings’ fame), Tommaso Campanella’s City of the Sun, and Francis Bacon’s New Atlantis — that word being ‘eutopia’. The word is also of Greek origin, but signifies ‘good place’. Some see utopias and eutopias alike as heralding the possibility of reforming present society toward some idealised end point — what Herbert Marcuse, the 20th-century German-American philosopher, referred to as ‘the end of utopia’, when ‘material and intellectual forces capable of achieving the transformation are technically present’. However, long ago, Aristotle pushed back against the concept of utopia as an unattainable figment — a chimera. Later political theorists have joined the criticism, notably More’s contemporary, the Italian political philosopher and statesman Niccolò Machiavelli. In The Prince, Machiavelli concurs with More’s notions of cynicism and corruption seen in society generally and in politics specifically. As such, Machiavelli believed that the struggle for political supremacy is conflictual, necessarily lacking morality — the ‘effective truth of the thing’ in power politics. ‘Politics have no relation to morals’, he stated bluntly. Machiavelli thus did not brook what he regarded as illusory social orders like utopias. ‘Our business here is to be Utopian, to make vivid and credible, if we can, first this facet and then that, of an imaginary whole and happy world’. In that vein, many thinkers have taken their definitions to the next level, offering concrete prescriptions: deconstructing society’s shortcomings, and fleshing out blueprints for the improved social order envisioned. These blueprints may include multiple dimensions: political, economic, ecological, moral, educational, customs, judicial, familial, values, communal, philosophical, and scientific and technological, among others. ‘For the laws of nature … of themselves, without the terror of some power, to cause them to be observed, are contrary to our natural passions’. That is, given that the ‘natural condition of mankind’ is to incurably and quarrelsomely seek ever more power, the civilizing effects of laws and of governance are required to channel people’s energies and ambitions, and to constrain as necessary. ‘Utopias die, utopianism does not’. The apprehension, then, is that even in a declared utopia, powerful leaders might coerce reluctant conformists to fit into a single mold. Dangerously patriarchal, given possibly counterfactual evidence of what’s best for most. So, might ‘utopia’ be defined differently than any single idealised end point, where ‘satisfied’ architects of utopia feel comfortable putting their tools down, hinting ‘it’s the end of history’? Or instead, might utopianism be better characterised as a dynamic process of change — of a perpetual becoming (emergence) — directed in the search of ever-better conditions? The key to utopianism is thus its catalytic allure: the uninterrupted exploration, trying out, and readjustment of modalities and norms. ‘Expectation, hope and intention, directed towards the possibility which has not yet arrived, constitute not only a fundamental property of the human consciousness but also … a fundamental determination at the heart of objective reality itself’. Fritjof Capra writes, 'To explain something means, ultimately, to show how it is connected to everything else.' He is speaking about an infinity relations in this world — while we ourselves are finite. When we think on our own finitude, we understand that the greatest number of relations lie beyond our power to explain, and beyond our control. This means that we should be wary of totalising urges, which seek — impossibly — to conquer infinite relations. Where we strive for an unreachable mastery, unintended consequences are bound to disrupt our ambitions, and set the bar for control even higher — impossibly, unnaturally higher. This is the peril of utopia. The requirement is rather a humble compassion for our fellow human beings. I once visited what was meant to be Pol Pot's agrarian utopia, when the country was still at war. Yes, I think Pol Pot is a good example, actually. There seems to be an inherent authoritarianism in the utopian ideal - after all, it supposes itself to be the best and shuts down alternatives. On the other hand, as Keith says in this thoughtful piece, if a utopian ideal is seen merely as an alternative model that provides ideas and strategies for improving our 'present place', then surely it should retain a legitimate role in our thinking. As for the ‘peril’ of utopia, I would agree, Thomas, that striving for ‘unreachable mastery’ risks leading to calamitous consequences. On the macro scale of nation states, vain attempts at ideological purity have found expression in history’s ‘isms’. On the micro scale of, say, cults and compounds, the ardent chase for purity — and for idealised social order, to which everyone is required to conform — not untypically ends catastrophically. At both the macro and micro level, Jouvenel wasn’t too far from centre in declaring, ‘There is a tyranny in every utopia’. Though just how tyrannical varies. But although there must be caution (and unpretentiousness), the pursuit of something better is, as Martin hints, an arguably noble and necessary ambition. For which, perhaps, there is no alternative; inertia, drawn from either fear or self-satisfaction, is surely unacceptable. After all, the churn of our striving, no matter how imprudent at times, is ultimately and fundamentally what spurs progress. I fear that our progress may be counter-productive. Not all of it! But more than we think. The spiking inequality -- across all sorts of economic, social, and governance models -- would seem to bear out your point, Tessa. But I wonder if appearances are slightly deceptive. That is, resources aren't necessarily zero-sum, even if that's the perception. Rather, what I think makes the difference between the richest and the poorest -- what gives rise to the (mis)perception of zero-sum resources, all the while in face of the reality of resources terribly unequally spread around -- is in actuality a difference in power and control over the self-serving mechanisms that drive national policymaking.